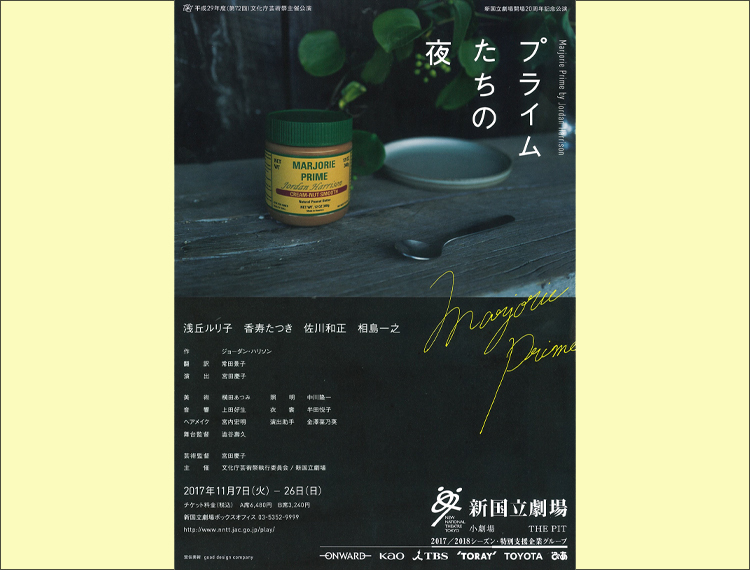 This is the latest in our series of presenting Japan Premiere of Western plays at the NNTT which has included "SIXTEEN WOUNDED" in 2012,"Time Stands Still" in 2014, "Bengal Tiger at the Baghdad Zoo" in 2015 and "The Flick" in 2016. This fifth play in the series is "Marjorie Prime" by rising American writer Jordan HARRISON. In this series, we have selected plays that touch on various issues taking place around the world, focussing on the "current" state of the world, some serious, some comical. In the same vein, "Marjorie Prime" addresses the universally human topic of growing old, experienced equally by all, portrayed through the conversations of the four characters. Having worked together twice before in this series, translator TSUNEDA Keiko and director MIYATA Keiko pair up for a third time to take on "current" issues. Z seats are available at the Box Office from 10:00 a.m. on the day of the performance. One ticket per person. Telephone bookings are not accepted.